Hello guys, now we're sharing another best blog style blogspot template. You know, msdesignbd always share awesome and creative blogger templates. Now we're sharing another best and premium template for you, if you running a blog on blogger platform then you should try this awesome and minimalist blogger template. Relish is a fully responsive and SEO Optimized blog style blogger template. Relish is another best blogging template by MS Design. If you running a blogging site, then we recommended you for using this blogger template. 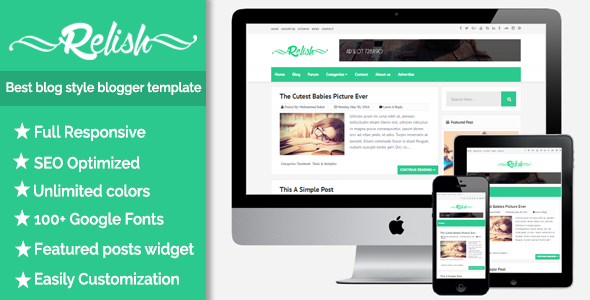 Relish blogspot template is a 100% responsive blogger template that compatible with all device. This is very easy to customize this template with one click. You can apply Unlimited colors and 100+ Google Fonts from Blogger Template Designer Option. It have some awesome features. You can easily customize this template without any coding knowledge. Relish is highly optimized pure responsive designed blogspot template, that is compatible with all kind of smartphone device. Mobile friendly template are most important for SERP. Relish is mobile friendly and user friendly blogspot premium template that will make your blog more fast. This is very simple way to change whole template color with one click. You can change any section color with one by using Relish blogspot template. Here is lots of option to change template section color from Blogger template designer. You have need to go Edit HTML option to change anything on this template. First time we used 100+ Google Fonts on Relish Blogger template. You can change any section's font from Blogger Template designer easily. Hope guys, all are features of this template you will like. Your work is always beautiful. This template is also looking great. Why did you not add recent post widget in this template? Awesome template bro, would you like to post another free template for relish bro? Thanks for share. An awsome template. Leave a comment on Themeforest. tell me bro please....how to add submenu ? Did you brought this template? Then leave a comment on themeforest item. Thank you.